I recently read Tony Hsieh’s Delivering Happiness. Tony is the CEO of Zappos, an online shoe-seller. Hsieh seems to be a entrepreneurial genius. While a student at Harvard, he founded an internet company, which he later sold to Microsoft for millions. Then he invested in Zappos, which became the largest online shoe-seller and eventually merged with Amazon. Hsieh’s book portrays a fantastic model of building a company by building its culture around its values, economic drivers and vision beyond the company. It seems that he has been able to engage cultural displacement and the lack of collective identity by developing a tribal identity for the corporation, its investors and its customers…without being corporate. The book also provides great examples for recruitment, interviewing, staff development and succession planning. Hsieh primary presupposition is that you can create a work culture of happy people, and, as a corporation, you can value happiness more than profit, which in the long-term will mean higher profits. So, says Hsieh, if someone calls Zappos and wants to know where they can order a pizza in the middle of the night in their city, Zappos phone agents will try to help you out – even if you aren’t buying shoes. While I find the idea of promoting happiness over profit refreshing, I ultimately don’t see how Hsieh or Zappos delivering what it promises. Sure, paying clients may sense happiness when they receive a surprise gift of flowers from Zappos, and Zappo employees may sense happiness as their company invests in their professional development and encourages a happy environment, and Zappo investors may sense happiness as they receive a return on their investment, all the while believing that they are bettering the world. But what about the shoe maker? Stories continue to come out about shoe corporations, like Nike or Adidas, exploiting their workers in countries likeHonduras,El Salvador andIndonesia. Does the happiness of these workers matter to Zappos? Is happiness reserved for the wealthy who can purchase via the internet and forgotten for the poor who suffer the brunt of corporate outsourcing? “Delivering happiness” seems to be a clever sales ploy but, by failing to recognize the unhappiness of those who produce their goods, it is deceptive. Happiness, delivered on the backs of the unhappy, is no happiness at all. « Our Enemies: Why Do They Hate Us? I get the point and agree that consumers, middle-men and businesses need to be conscious of those that manufacture goods. It doesn’t seem fair to me to single out Zappos. If you have ever ordered from Zappos and interacted with their customer service, you will see what they are talking about. For the customer, they are delivering happiness. Personally, I will never buy shoes anywhere else. They have sold me. I would challenge you to make this post more constructive. How can Zappos be more aware of conditions and also make its customers more aware of worker conditions? I would love to see what others think on about this. @David – thanks for making us more aware of something often overlooked by shoe junkies like me. Thanks Jud for reading the blog and for your comment. I wanted to wait to see if there were other responses before I replied. I probably didn’t communicate well enough the positives of Zappos. That was what I attempted in the first two paragraphs but certainly more positives could be said. Also, I don’t want to give the impression that only Zappos should be held responsible for the treatment of factory shoe workers. All shoe manufacturers, sellers and consumers should participate in ensuring fair treatment for the laborers. However, not many shoe companies purpose a goal other than profit, and profit is usually the justification for paying low wages. 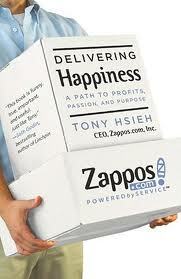 By claiming “happiness” and not “profit” as its main motive, Zappos is holding itself to a “higher” standard. And I think that standard should not be applied to its staff and its customers but also to the laborers of the products it sells. And if it doesn’t include the shoe factory workers in its measurement of happiness, I don’t think the company can ultimately deliver what it promises. Also, because Zappos occupies a large proportion of the national shoe sales market, I think an initiative on their behalf to “deliver happiness” to shoe factory workers could positively influence the whole of the shoe market. Just look at the effect of TOMS Shoes (http://www.toms.com/international), which is meager in terms of market size in comparison to Zappos.